Rome, in the Spring of 1501. Salaì, a young and good-looking apprentice painter arrives in the holy city with his godfather: a muddle-headed, frustrated, penniless old man whose brain teems with improbable inventions that never work: a certain Leonardo da Vinci. 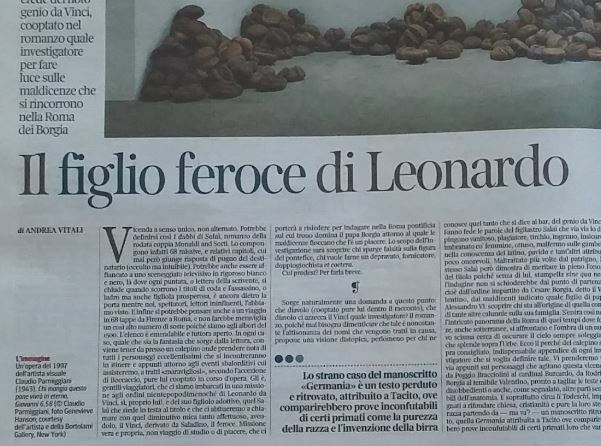 Leonardo does not know this, but the young Salaì has been hired by an influential citizen of Florence to spy on him: the artist, who is also a military engineer, is suspected of working secretly for foreign powers. 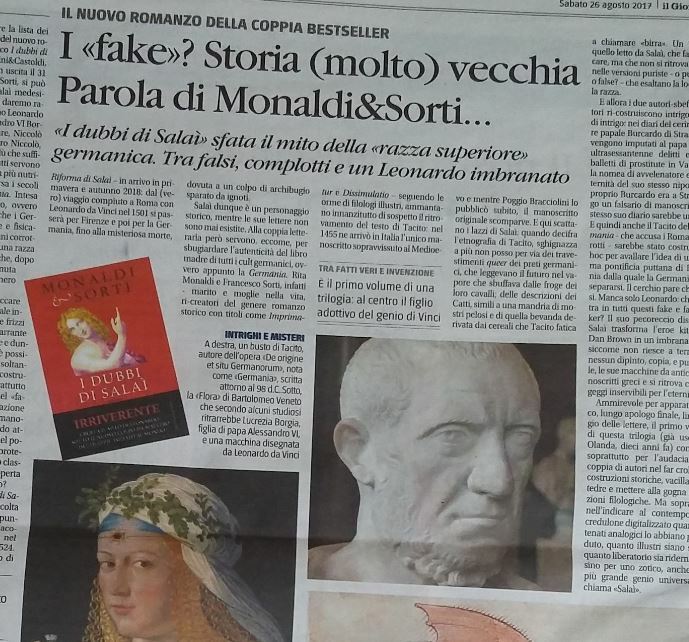 Leonardo has in fact come to Rome to study ancient Roman architecture in situ, but this is all just a cover for another activity: in reality, he has been called to investigate who is spreading slander about the Borgia Pope Alexander VI. In reality, the old, gauche, cowardly Leonardo is absolutely unsuited for such perilous and complicated investigations. After a while, he prefers to abandon Rome, leaving Salaì in the lurch. The young man wastes no time getting involved in many spicy and gallant adventures with beautiful Roman women and soon discovers that Leonardo is indeed betraying Florence with the Turks, for whom he is planning a bridge over the Bosphorus. During their hunt for those slandering the Borgia Pope, Leonardo and Salaì come up against a strange homicide which took place a few years earlier: a papal scribe brutally hacked to death in his bed. 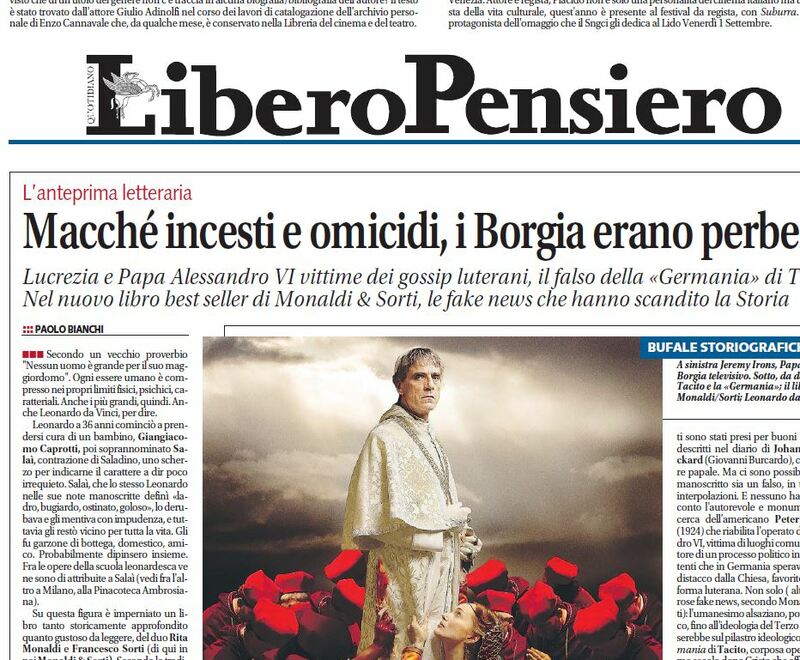 There is a connection between the crime and a strange but powerful group of Germans living in Rome: prelates, bankers, artists and men of letters. Among them, figures who have come down to us in history, such as the Fugger banking family and the Master of Papal Ceremonies Johann Burchard. The common factor in all these things – the slander against the Pope, the death of the scribe, the German lobby in Rome – is a character who has been dead for quite some time: Poggio Bracciolini, the glorious humanist who, decades earlier, discovered the manuscript of Tacitus’ opus Germania. Strangely, just now that Leonardo and Salaì are in Rome, Tacitus’ Germania is becoming a burning issue: the Germans living in the city speak of nothing but this book and the threatening political proclamations of the German humanists and their friends, engaged in a fiery propaganda campaign against the Church of Rome. The recent invention of printing is giving a powerful boost in Germany to the whole current of hostility towards Rome. It all seems to be radiating from one city: Strasbourg. The very city where, according to legend, the cathedral conceals the gates of Hell. Poor Salaì, who knows nothing about politics and is able to write only the most ungrammatical letters to his Florentine employer, is obviously terrorised. But his lack of education does not prevent him from understanding that the keys to the anti-Papal propaganda are to be found in the falsification of ancient documents, and above all in the creation of false historical truths. Salaì will discover that Burchard himself is behind a forged diary used as a basis for the calumnies against the Pope, in which he is simply copying and re-using Boccaccio’s famous tales. Despite all his fears and the his genial patron’s mental confusion, Salaì will arrive at the solution, not out of heroism but for no better end than to earn good pay from the powerful Florentine gentleman who recruited him to spy on Leonardo: a certain Machiavelli. In their concluding notes, as in every novel by Monaldi & Sorti, the reader is shown that not much of all this is the fruit of fantasy. Salaì really was Leonardo’s adoptive son, and all the details of the relationship between the two are based on period sources. Leonardo really was in the service of the Borgias (in particular that of Cesare, the famous Valentino) and in contact with Machiavelli, who had to deal with the problem of his infidelity to Florence. In 1501 Leonardo did come to Rome to study ancient monuments, and he really did betray Florence, in the hope of entering into the service of the Turkish Sultan, for whom he also planned his famous bridge over the Bosphorus. Similarly, Alexander VI was far from the monster he has been depicted as – as was already demonstrated in the Nineteen-Twenties by an American historian of Belgian origin, Peter De Roo, whose five-volume work (written in English) constitutes the most wide-ranging of all studies on the Borgia Pope, yet has almost disappeared from the world’s libraries. The authors had his entire opus digitalised and placed on Internet, so that every reader can verify the authenticity of what we claim in the novel and in the final notes. Moreover, the powerful lobby of the Germans in Rome, centring upon the Confraternity of Santa Maria dell´Anima, consisted of real people. Burchard too, in his famous Diary, really did plagiarise Boccaccio, as the authors show in an appendix to the novel. Finally, the falsification of Tacitus’ Germania is anything but an invention. For centuries, many authors in many lands have affirmed the falsity of these supposed writings of Tacitus. 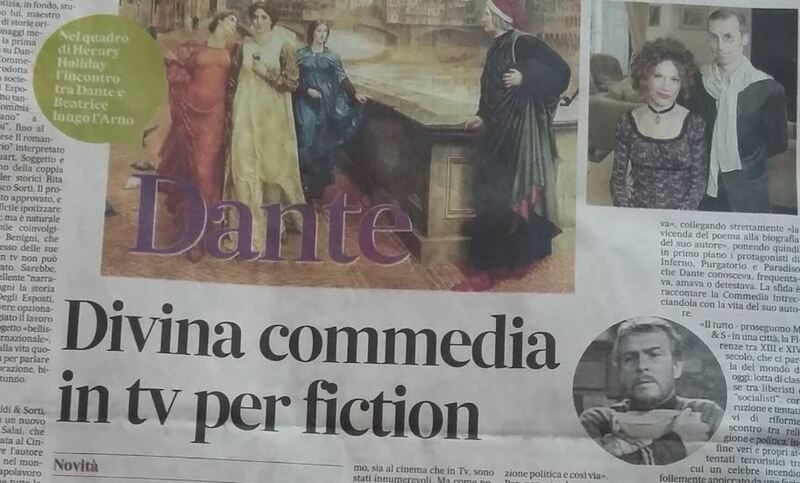 By means of a real conspiracy of silence, the academic world (and not the Vatican, as in Dan Brown’s trash thrillers) has succeeded in imposing a leaden silence on all dissent concerning both Tacitus and the Borgia Pope.